When Casino was released in theaters in 1995, I fondly remember hitting the theater opening weekend. I must have been 19, and alone no less. And for 3 full hours, I remember being immersed in this glitzy world of Las Vegas corruption, murder and politics. For a guy who didn't care too much for topics like that at the time, I was fully engrossed in this world brought to gorgeous life by Martin Scorsese and his incredible cinematographer Robert Richardson, who's worked regularly for Tarantino, Oliver Stone and Scorsese, giving each one of their collaborations some of the most stunning visuals ever put to film. When Casino was released on VHS, I bought it immediately, and not just any VHS, no sir. Since the film was so long, it came in one of those 2-pk sets, but the best and most important thing about this particular release was that it was released in widescreen, which is truly the only way to see it. Yet somehow I never upgraded from that VHS release and worse yet, I rarely remember revisiting it. When I noticed it was streaming on Netflix in HD recently, I jumped at the chance to not only revisit it, but to introduce it to my wife who isn't much of a Scorsese fan to begin with, hoping this would change her mind. We sat down one Sunday afternoon and threw this on for what felt like the entire day; and I mean that in the best possible way. Yet despite it's 3 hour running time, not once did it feel tiresome or overstay it's welcome. In fact, after a good 2 hours, I paused to ask my wife if she wanted to take a break and get back to it later, thinking maybe it was too long for her taste, where she just gave me a "are you crazy?" look. She was hooked and did not want to stop watching it. And my feelings were exactly the same because upon revisit, I've come to realize that this film is my favorite Martin Scorsese film. For a film that runs 3 hours, you never feel it because the film moves along at such a brisk pace, never once slowing down, not even for the dramatic moments, because Scorsese and Richardson's lush visuals, tight editing and excellent 70's soundtrack keep the film floored at such a breakneck speed that it's almost exhausting. But that's a good thing! Because long films, while quite excellent, can oftentimes overstay their welcome. Casino doesn't. In fact, you want more. Though writer/director/producer/actor Martin Scorsese will almost always be known for his gangster films, he had been experimenting with different genre's between his seminal classic Goodfellas (1990) and this film. 1991's Cape Fear was a sort of Brian De Palma-on-crack-style thriller where Scorsese really let loose with some crazy camera-work, but didn't quite deliver the punch it could have. He followed that up with 1993's Age of Innocence, a period piece where he took a sharp detour from his usual violent fare into drama and costumes before heading back into the crime genre once again with Casino in 1995, which would mark his first of many collaborations with legendary cinematographer Robert Richardson, who was fresh off the success of Stone's Natural Born Killers. Goodfellas screenwriter Nicholas Pileggi returns and along with Scorsese, co-writes another instant Italian Crime classic. It's a shame that this film is rarely ever mentioned, or even put in the same league as Goodfellas. Everyone seems to just automatically refer to Goodfellas as their favorite Scorsese film, yet personally speaking, I feel this one is a little better. 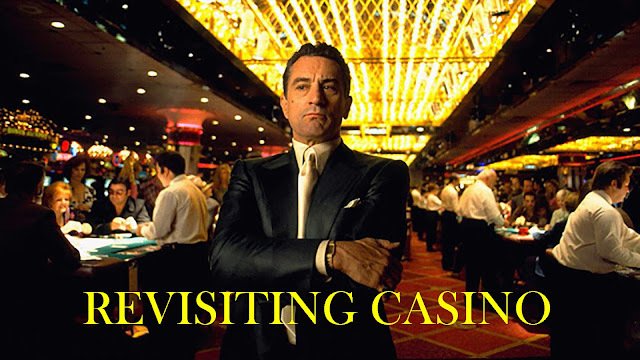 Sure it's all relative, but I think if you really take the time to study this film, you'll find that there's so much more Casino has to offer than Goodfellas. That's not to say Goodfellas isn't great, because it is. It's fantastic. Casino is just a very different type of gangster film. It's a much more polished and glamorous looking film, but doesn't glamorize what's happening either. It's every bit as graphic, violent and shocking, but just in a more flashy and almost gaudy way within it's Las Vegas setting and Scorsese and Richardson's lush gorgeous visuals that take full advantage of the bright neon lights and fashion of the 70's and 80's. Casino is an experience unlike any other. 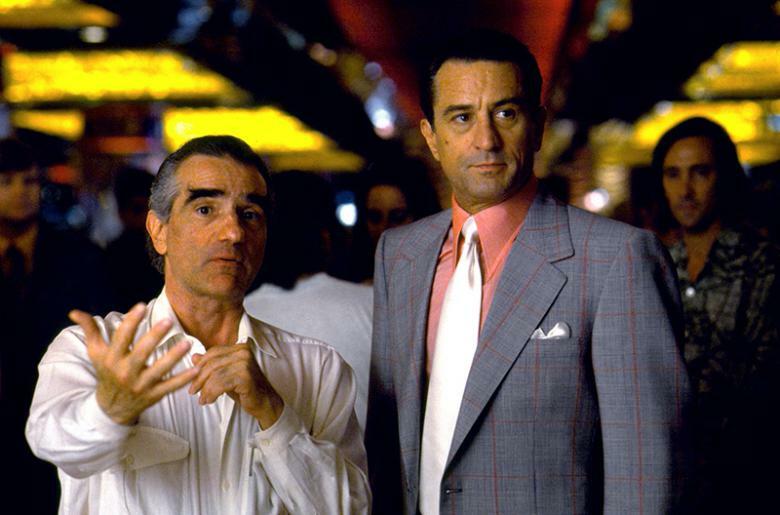 It's a film that's sadly been sidelined in both the gangster genre and Scorsese's own filmography in favor of the landmark Goodfellas, a film that very much deserves it's praise, but in my opinion, falls a bit short of Casino's grande, epic storytelling. If it's been a while since you've last seen this, I urge you to give it a watch. I'll bet it's far better than you remember it being, and I think it's high time I finally upgrade this to Blu-Ray for the collection.